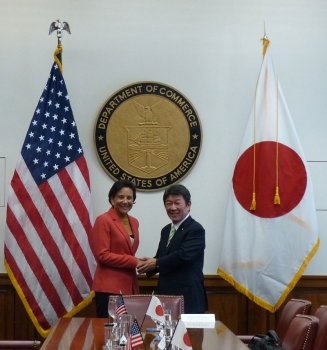 U.S. Secretary of Commerce Penny Pritzker today met with Toshimitsu Motegi, Japan’s Minister of Economy, Trade and Industry, who is the head of the Commerce Department’s counterpart agency in Japan. Additional meeting participants included Under Secretary for International Trade Francisco Sánchez and Japanese Ambassador to the U.S. Kenichiro Sasae. During the meeting, Secretary Pritzker and Minister Motegi discussed the importance of concluding the Trans-Pacific Partnership (TPP) trade negotiations this year, which is a top priority for the Obama administration. Japan recently joined TPP negotiations, bringing the economic impact of the 12 TPP countries to 40 percent of global GDP. The secretary affirmed to Minister Motegi the U.S. commitment to working with the Japanese government to reach consensus on the TPP countries’ shared vision for a comprehensive, 21st century trade and investment agreement, which will enable the Partnership to promote economic growth and regional economic integration. Secretary Pritzker also talked with the minister about SelectUSA, President Obama’s initiative to facilitate business investment in the United States. This fall, the Commerce Department is hosting the first-ever SelectUSA Investment Summit to connect foreign and domestic investors with U.S. economic development organizations. Japan is the second-largest source of foreign direct investment in the U.S., and the Summit provides an opportunity for firms and investors to connect with U.S. cities and states in support of job creation and economic growth.